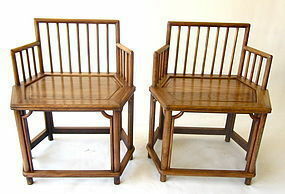 Pair of Chinese armchairs made all of beautiful honey colored hardwood, most likely huanghuali, each seat with six sides, very elegant lines with dowels for back and arms, mid 20th century. Size of each: 32 1/2" high x 27" wide x 20 1/2" deep. 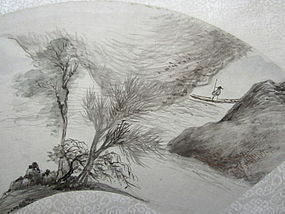 A Chinese literati themed landscape fan painting with a signature reading the name of Li Ching-yi. The soft pastel colors and brush strokes of the landscape evoke the preferences of the literati scholar tradition. 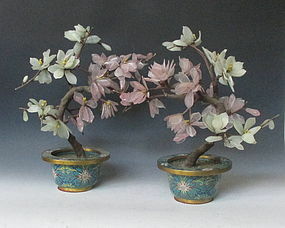 Age: Qing Dynasty 18th/19th century. Size: Length: 19.75" Width: 12.6"
A refined Chinese fan painting of a literati scholar enjoying the breeze within the pine grove from the window. 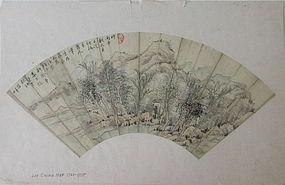 The writing expresses the view of the fan painting where the scholar is listening to the wind among the bamboo groves in the evening, signed "Ke Mou"?. Title "Listening to the Scholartree". 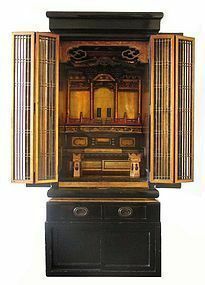 Age: Qing Dynasty 18th/19th century. 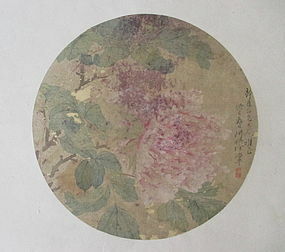 Size: Length 22" Width 10.2"
A circular shaped album leaf painting done on silk of a peony. The work contains an inscription, signature and seal of an artist named Xu Zhiping. 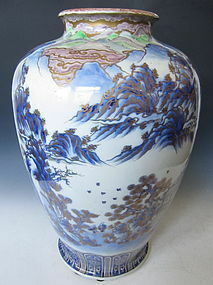 The work and style appear similar to examples seen in China during the mid to late Qing Dynasty. Age: 19th century Size: Length 23.5" Width 14.2"
Charming Japanese fan painting depicting a small bird on a branch, painted in ink and light color on paper, attributed to Kawabata Gyokusho (1842-1913), Meiji period circa 1900. Size: 17" long x 6" wide. A splendid and unusually large tetsubin decorated with geometric patterns with peonies and butterflies set within a frame. This piece is a collaboration of two major artists. 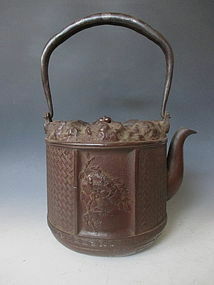 The body has a seal by the kama-shi or tea kettle maker, Okuni Jurou, and the lid is signed by Kinryudo. Okuni Jurou, along with his father Okuni Toubei were famous for their skill and artistry during the Meiji and Taisho Periods. Condition is original and excellent. Size: Diameter 9.5" Height 14"